Strengths: After more than twenty-five years of playing hockey, Larionov was still one of the best passers. He was a great leader on-ice and one of the most intelligent hockey players. Weaknesses: In his later seasons, Larionov became a slower skater. Also, he was not a frequent goal-scorer at the NHL level. Biography: Igor Larionov grew up in Voskresensk, a factory town not far from Moscow. Larionov was good enough to have made it to the local team Khimik at the age of seventeen. From 1977 to 1981, Igor played for his home team, scoring 73 points in 123 games. Larionov wanted to serve his two-year term in the army and return to play home, but Central Red Army coach Viktor Tikhonov did everything in his power to have Larionov on his team. In 1979 and 1980, Larionov was on the Soviet teams that won the World Junior Championship. 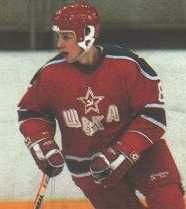 As a member of CSKA for eight seasons, Larionov became one of the highlights of the Soviet hockey program. He was the center of the famous “KLM” line with Vladimir Krutov and Sergei Makarov. Every year, Larionov’s team was the USSR’s champion. During this span, Igor was a five-time all-star and in 1988 the Soviet Player of the Year. Larionov was also one of the best players at international tournaments. He won the gold medal at the 1984 and 1988 Olympics, and the World Championship in 1982, 1983, 1986, and 1989. In 1981, Igor helped the Soviet Union beat Canada for the Canada Cup. 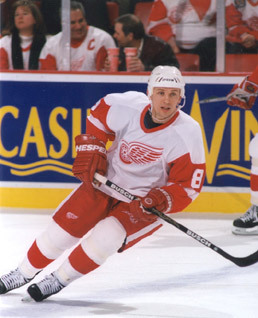 Along with teammate Slava Fetisov, Larionov fought for the right to continue his hockey career in the NHL. Despite being drafted in 1985, Larionov was permitted to join the Vancouver Canucks only in 1989. In the NHL, his hockey sense and creativity were only second to Wayne Gretzky’s. Igor spent three years in Vancouver, but due to contract problems between the Canucks and CSKA, Larionov left the NHL in 1992. He spent the next season playing for Lugano in Switzerland. Igor learned some Italian in the process. In 1993, Larionov returned to the NHL, but this time to the San Jose Sharks. He played with Sergei Makarov again. In October 1995, Larionov was traded to the Detroit Red Wings and joined fellow Russians Sergei Fedorov, Slava Kozlov, Slava Fetisov and Vlad Konstantinov. Larionov played a big part in helping the Red Wings win the Stanley Cup in 1997 and 1998. With Kozlov and Fetisov, Igor brought the Stanley Cup for the first time to Russia. He also brought it to his old hockey rink in Voskresensk. Larionov still played in international tournaments for Russia. He participated in the 1996 World Cup and won a bronze medal with Russia at the 2002 Olympics. 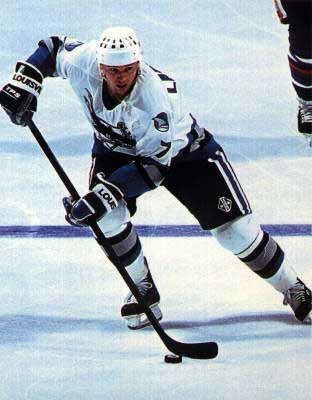 In 1998, Larionov played in the NHL all-star game. After a short stint with the Florida Panthers in 2000, he returned to Detroit. Igor won his third Stanley Cup in 2002, but refused to retire. He brought the Cup to Russia again. In 2003-04, Igor played for the New Jersey Devils. He had a few problems with the coach, and his skill level decreased with age, forcing Igor to retire. 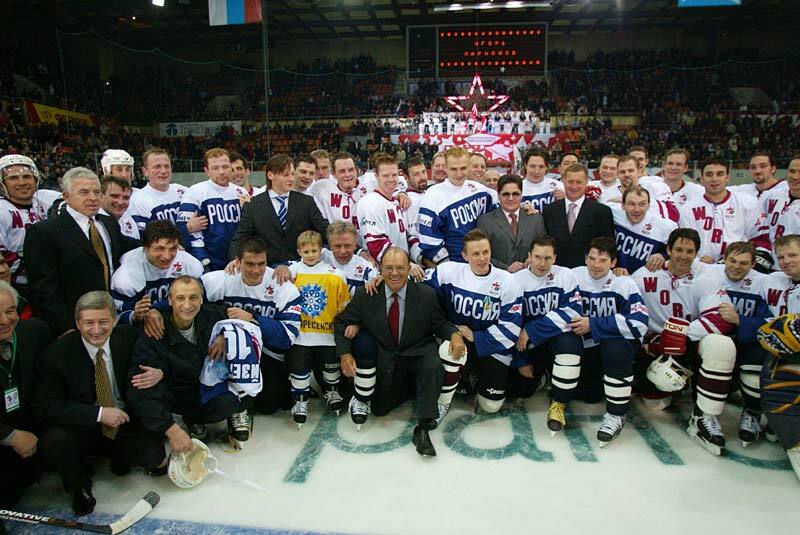 On December 13, 2004, Larionov hosted an extravagant farewell game at Moscow’s Luzhniki arena. The match pitted Team Russia (a mix of past and current Russian stars, including Larionov himself, Fetisov, Nabokov, Fedorov, and Kovalchuk) versus Team World (Larionov’s former Detroit and New Jersey teammates, including Brendan Shanahan, Steve Yzerman, Chris Osgood, Scott Gomez, etc.) For the third period, Larionov and Steve switched teams and Russia won the entertaining game 6-5. In the post-game celebration, Larionov was awarded the Order of Friendship by Prime Minister Mikhail Fradkov. This was a memorable end to the legendary hockey career of one of the most highly respected people in sports.